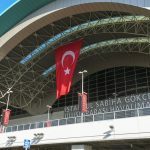 Atatürk International Airport, named after the founder and first president of Turkey, is the biggest airport of that country and one of two airports serving Istanbul, the other being Sabiha Gökçen airport. It is located on the European side of the city, 24 kilometers west of the Istanbul city center. 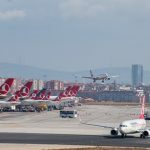 The airport serves as a main hub for Turkish Airlines and it’s been Europe’s 5th-busiest airport. In 2015, it served more than 60 million passengers and, in 2017, it was declared as the second-most non-stop destination worldwide after Frankfurt Airport. Anyway, there are several ways of getting to and from the airport. NOTE: Atatürk International Airport is closing in spring 2019, all information about the new Istanbul Airport coming soon! Airport shuttle bus: There is a shuttle bus Havabüs operating from the airport to Taxim square, the center of Istanbul. The buses run every 30 minutes the following route: Atatürk Airport – Coast Road – Bakırköy – Yenikapı – Aksaray (Marmaray) – Taksim. Getting to the center takes approximately 40 minutes (depending on the traffic), and the price of a one-way ticket is 12 TL. Because of its size and importance, the city of Istanbul is very well connected to the airport via public transport, too. But since it is a huge city set on two continents, the public transport is also complex. Therefore, there are many ways of getting to the central parts of the city, and here are the most common ones. NOTE: While staying in Istanbul, you can use the public transportation boarding pass and save some money – Istanbul Kart. The easiest way to get the card is at the airport, but in case you forget, you can also make it at Sultanahmet and Eminönu. You need to pay a non-refundable 10 TL fee (for the actual card and the service) and an amount of your choice to load onto the card. To reload the card, you can go to newsstands and small shops which offer this service. Metro & Tram: One of the options to get to the center is to combine these two means of transport. 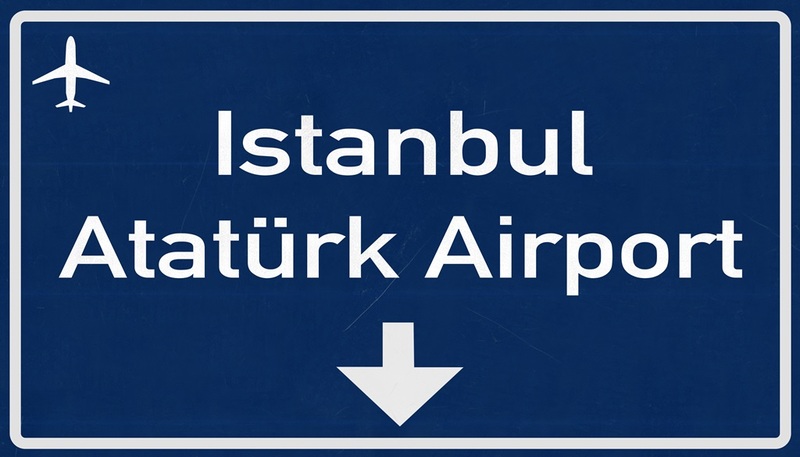 Follow the signs for the Metro/Light Rail at the airport in order to get to the metro station ‘Atatürk Havalimanı’. The metro goes in the direction of Yenikapı and you will have to get off at the 6th station to catch a tram that goes in the direction of Katabaş. The 15th stop will be Sultanahmet, the old city core. You can also continue your journey to Taxim square with the same tram, going to the final station which is the Galata Tower and then taking the Funicular to get to the Taxim square. If you possess an Istanbul Kart, you will pay 2,50 TL per ride, and there is an additional discount if you use it for more transfers within 2 hours. Local bus: There is also a bus line 96T connecting the airport and the Taxim square starting from Yeşilyurt over Bakırköy Seaside, Zeytinburnu, Yenikapı, Aksaray, Unkapanı, Şişhane to Taxim. 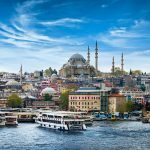 Seabus: One of the options to explore and get to a certain part of the city is taking an İDO seabus to different parts of Istanbul from Bakırköy. Because of their speed, they run longer routes, and you can check the possibilities here. Taxi service: If you would like to avoid the crowded public transport, consider taking a taxi but have in mind that this is the most expensive option. The usual price for the ride from the airport to Sultanahmet is 52 TL, and to Taxim square a bit more. The prices are fixed and don’t vary depending on the part of the day/year. You can find taxis waiting in front of the terminal, the ride takes approximately 30 minutes. Transfer: If neither public transport nor taxi services are viable options for you, consider booking a private transfer online. We recommend you do this in advance so that your drive can already be waiting for you in front of the airport when you arrive. Renting a car at Atatürk airport: For those who would prefer to reach the city and explore the area on their own, the best option is to rent a car directly at the airport. There are numerous companies you will find at Atatürk airport such as Sixt, Airport Tur, Alamo, Avias, Avis, Baf Turizm, Budget, Dollar, Europark, Europcar, Hertz and more. Compare their prices and book your car online. Renting a bus at Atatürk airport: If you are coming to Istanbul with a larger group of people, we advise renting a bus, though make sure to do so prior to your flight so that the bus company can organize everything on time. A: No, that won’t be a problem. The shuttle buses and public transport run till late at night, and you always have an option of taking a taxi. A: Yes, there are several options in the circle of under 2 kilometers (1.5 miles). The closest one is TAV Airport Hotel being a part of the Atatürk airport, the other ones near are WOW Istanbul Hotel, Rox Hotel, Florya House Hotel and Ramada Encore Istanbul Airport. Q: I would like to visit Istanbul in between flights. Is that possible? A: Yes, the city is huge but has a very good connection with the airport. 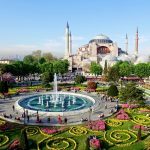 Depending on the traffic, the journey from the airport shouldn’t take more than an hour to get to Sultanahmet. Have in mind that a few hours between the flights will be enough for a few sights only. You can store your luggage at the airport and the prices up to 24 h are 15 TL for a hand luggage, 18 TL for a suitcase and 25 TL for a big bag. The luggage office is open 24/7. A: Yes, you will find many ATMs of 8 different banks that accept all cards with Visa and Maestro sign, and they are available 24/7. You will also find several turkish banks and currency exchange offices most of them on the Arrivals Floor. Q: I am continuing my journey outside Istanbul. Are there any direct lines to other destinations? A: Not directly from the airport, but you can check the possibilities at the main bus station in Istanbul or on GetByBus.